For a level 1 party! A flock of kenku bandit's have discovered the ruined remains of a temple site, and have used it as their hideout while they raid unsuspecting travelers on nearby roads. It's up to the PCs to clear their nest, recover stolen goods, and rescue their hostages. Will the players be bested by these dirty birds? Or will they have the bandits eating crow? Bandit's Nest is part of Dungeons on Demand: Volume One. "Kenku understand Common and Auran, but cannot speak either language. Fortunately, kenku are incredible mimics..."
Couldn't pass up such a good deal after reading the reviews. The creator also has a KS project that has just over a week left on it. It was there another backer told me about DriveThruRpg and this sweet deal. I think I'll be pickin up a few more now! Glad you liked it! Thank you for your support! Great module. The only very small nit-pick I have is that when I see the yellow trap icon, the yellow makes me think of gold, and the gold makes me think of treasure. Likewise, when I see the red/orange treasure icon, red makes me think of danger, and the color is similar to the hostile creature icon. If the treasure icon were yellow and the trap icon were red/orange, the adventure would be perfect. Again, I realize this is just a very small nit-pick. Everything else is wonderful. Thank you for this fantastic adventure! You're very welcome Brian! If I get similar feedback about the icon colors I'll definitely consider changing them. Thanks for your reply! Damn, that was a fast turnaround! Mention the problem May 10. It gets fixed May 11. He has just revised the module with many small improvements to icons, etc. 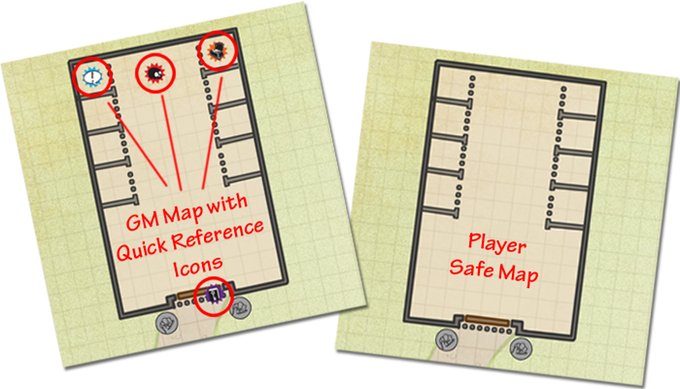 The BIG change is that he has now included player maps! The only real complaint people had. He listened to us and improved it. Way to go! Nice little module. Clean and simple, while being interesting. Wish it had Player maps, though. The maps provided show where traps and secrets are.